Sorry to be pussyfooting around about this, being oh-so-coy and teasing and all that sort of rot. Here's the link to Sorting the Shoe(gaze) Cupboard, a terrific post of songs by 26 shoegaze bands at Milk Milk Lemonade. I'd like to thank MML, as well as Indie-MP3 for pointing us toward the post. Oh, and here's a nice shoegaze summary at All Music, with lists of representative bands, albums, and songs. Look south while your spirit soars north. As usual, the 'sphere is ablaze with great hosted tunes. No doubt you spent several restless 24's wondering how I would resolve the dilemma of linking to my newly-discovered friend over at Retro Music Snob. The decision is Solomonic (though I have far fewer wives). I shall link to RMS, which will then direct you accordingly. That way everyone benefits. I told myself, though, I would limit myself to no more than five RMS links in a post. Myself rolled eyes, sniggered and wished me luck. We'll see. Soooo. . .
Catherine Wheel - Crank - Retro Music Snob - Keep preparing for shoegazer mania, if'n you haven't already found the post. Coming real soon. . .
Film School - What I Meant to Say - Quarter Life Party - Check your sabots, people. It be comin', I tell ya. Yeah Yeah Yeahs - Gold Lion - Can You See the Sunset from the Southside? Many thanks to all the wonderful hosts and hostesses. New to Music Blogging? Click here for help. The Happy Few. . . P.S. : Many thanks to 4casey4 at Milk Milk Lemonade and to The Happy Few. I’ve noticed quite a few new visitors coming in from the Totally Fuzzy music aggregator and wanted to say a word of welcome to you and all other visitors, including you cherished regulars. As you see in the intro to the right, our purpose is mainly to post mp3s of songs you might like as well as links to songs I find and like at other blogs. Please scroll down the page, check out the Streampad widget to the right, and dig into our Archives. The vast majority of mp3 links in the Archives are still working, although they sometimes get taken down at the source. The Labels in each post and down the page on the right are very useful. The following Powerpopulist Series might also serve as a good introduction now and in the future, so please click and see: Around the Blogosphere, Big Blocs, From the Archives, Little Hits Faves, SXSW (South by Southwest). Thanks for stopping by. I hope you find music you like and will come back often. Around the Blogosphere: In which pplist discovers a kindred spirit. . .
Sherwood - The Only Song - Can You See the Sunset from the Southside? Dios Malos - You Got Me All Wrong - Can You See the Sunset from the Southside? 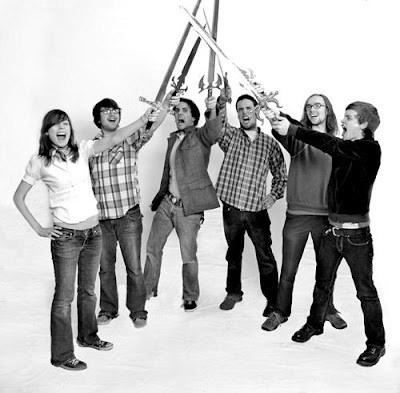 The Most Serene Republic - Sherry And Her Butterfly Net - SKATTERBRAIN - Stick with it; the song takes a brief time to warm up. The Sugarcubes - Delicious Demon - Broken Dial – (Maybe the only Sugarcubes song I like.) Found at a new friend (doesn’t know me, etc. ), a fellow/sister Texan (Dallas) whose entire blog--Retro Music Snob--is devoted to tracking down songs from the past, apparently loosely defined as up to the preceding wisp of a second. Other notable posts link to songs by Holly and the Italians, Nick Lowe, Garbage, Jesus and Mary Chain (“Head On”!! ), The Undertones (and further down, Feargal Sharkey), Stars (including the transcendent “Ageless Beauty”), The Judybats, Game Theory, and others too numerous to mention. I typed the word “Found” up there about thirty minutes ago. It took a long time just to hit the page down key over and over without stopping (but of course, I often stopped). Don't believe me? Go see for yourself. I discovered lots of excellent blogs I’m adding to my personal rota, too. This Dallasite is one busy beaver, with 26 posts just for Wednesday. I’m a piker, but at least I feel less guilty for pointing you toward stuff I like at other blogs. It’s weird pointing you toward a blog that points you toward other blogs. Pleasingly. Oh, and I think RMS wants you to bookmark the blog. Not sure, but that's the impression I get. Now to go wrestle with the dilemma of whether in future I should send you to RMS or the blog to which RMS sends you. Oh, happy, happy dilemma! Oh, wow, I previously paired Maritime and The Sounds. Amazing(ly jejune patter)! 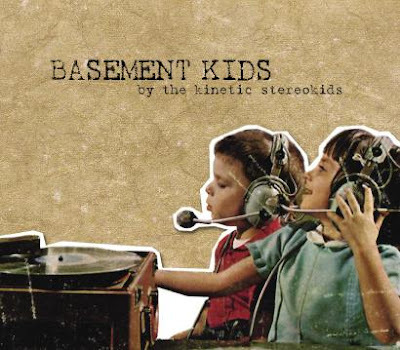 Is it enough that I mainly want to post music? This I may never know. In the meantime. . .
Maritime - For Science Fiction mp3 - Thanks to Pitchfork. Ryan Ferguson - Kill My Confidence mp3 - Thanks to 3hive, which has a bunch more by RF. Maps - Elouise mp3 - Thanks to Fingertips. Frank Allison - Athletic Dan mp3 - Thanks to Toolshed, which has four more FA's. Lots of newbies and several older buds are kindly being hosted. Many thanks to the hosts and hostesses. I don't mean to sound like a broken mp3 file, but some of these might be taken down soon, so haste is advised. Viva Voce - From the Devil Himself - Can You See the Sunset from the Southside? 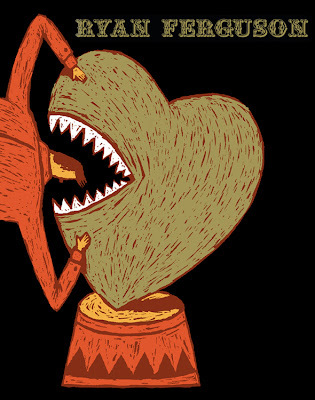 Dance With Your Shadow - The Fine Arts Showcase - Heartache with Hard Work - Excellent Rough Bunnies cover. . .
Dinosaur Jr. - Little Fury things - Can you See the Sunset from the Southside? The Sisters Of Mercy - Adrenochrome - Can You See the Sunset from the Southside? The Jesus and Mary Chain - Just Like Honey - Can You See the Sunset from the Southside? I'm continuing to play a little catchup from the down time two weeks ago. Hope you like. Sorry - Wedding Guest mp3 - Thanks to Gary at Seattle-Powerpop for the recommendation. He has more at his excellent blog. All for one and one for. . . Here are some recent finds I've really been enjoying. Thanks for stopping by. I don't say that often enough. Black Before Red - Teenage America mp3 - Thanks to Team Clermont, which has another. Aquadays - June mp3 - Thanks to Peter at Coast is Clear, who posted another. J. 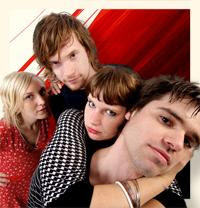 Forte - Come Back Now Baby (Your Data's Good) mp3 - Thanks to Morten at Hits in the Car, who has one more. I've been remiss, but these real bloggers haven't. Thanks, real bloggers. Jared was on an incredible tear at 5 Acts while I was "gone." 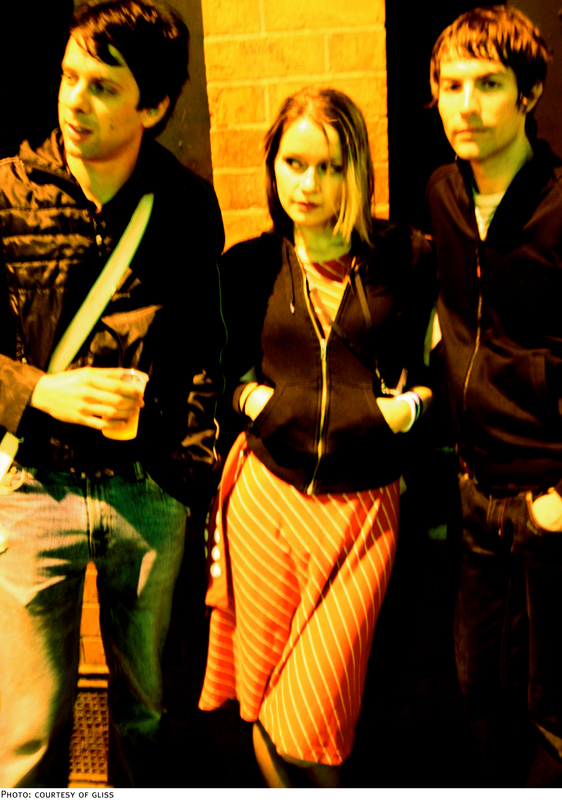 Gliss - Kissing the Boulevard mp3 - Thanks to spin.com. What Would Wolves Do mp3 - Thanks to AOL's spinner.com for this and the next two tunes. Tilly and the Wall - The Freest Man (CSS Remix) mp3 - Thanks to the 'fork. As promised, here are some of the "classics" I found at other blogs. These are the ones I like best at each post, most of them old friends. There are plenty of others you might like better. Thankee, hosts. XTC - The Mayor of Simpleton - An Aquarium Drunkard - Follow the bass line if you like. Amazing. XTC - Dear God - 5 Acts - This and the next two are found at the same post at 5 Acts. I don't really know what's the best way to do this, so I'm inconsistent, based on the way I feel on any given day. These next three are found at the same post at Can You See the Sunset from the Southside? R.E.M. - Radio Free Europe - Can You See the Sunset from the Southside? The Psychedelic Furs - Into You Like a Train - Can You See the Sunset from the Southside? Devo - Jocko Homo - Can You See the Sunset from the Southside? The next five are found at the same post at Can You See the Sunset from the Southside? XTC - Senses Working Overtime - Can You See the Sunset from the Southside? Modern English - Melt With You - Can You See the Sunset from the Southside? The Cure - Boys Don’t Cry - Can You See the Sunset from the Southside? U2 - I Will Follow - Can You See the Sunset from the Southside? Ramones - Blitzkrieg Bop - Can You See the Sunset from the Southside? There they go again, these generous hosts, and may they be blessed and thanked and anointed in whatever ways would give them pleasure. Etc. A nice mix of new and newish. Next time: some fab classics scattered about the 'sphere. . .
Satellite 66 - J.P. Morgan - Can You See the Sunset from the Southside? Surprise! I' ve found some songs I like. Perhaps we should be more propulsive here at the first of the week, but, um. . ., well, okay, if you're gonna twist my arm, the last one might gitcha goin'. 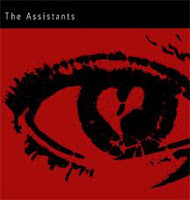 The Assistants - White mp3- Thanks to Frank over at Chromewaves for cleaning up. He's still got three Assistants. The Lost Patrol - Sirens mp3- Thanks to heet at Hot Stof, where one more by The Lost Patrol is found. The GoStation - Wandering Away mp3 – Thanks to Bob at extrawack! This link's fading in and out. Persevere. Art In Manila - Set The Woods On Fire mp3 - I previously posted one by these Nebraskans, in case you're interested. The Hives - Here We Go Again mp3 - Like, buzz, man.